Chicken breast is a staple in the diets of many healthy eaters and exercisers. It’s a great source of lean protein. Dieters who eat enough protein are more likely to maintain muscle mass and preserve a healthy metabolism. But trying to calculate chicken breast calories can be tricky because chicken breast nutrition varies based on a number of factors. Chicken breasts are a good source of protein and are low in fat and low in sodium. Chicken breasts provide zero grams of carbohydrate, so they are a low-carb food. The estimated glycemic load of chicken breast (skinless, boneless, and raw) is zero. Since chicken breasts are so versatile they are easy to incorporate into a healthy diet. But chicken calories can be tricky. The size of the chicken breast will affect the calorie count. A single serving of chicken breast is about three ounces or the size of the palm of your hand. Many commercially packaged chicken breasts are much larger than that. So if you eat a single breast, you’re probably eating more than a single serving. And, of course, if you keep the skin on your chicken breast, the fat and calorie count will be much higher. 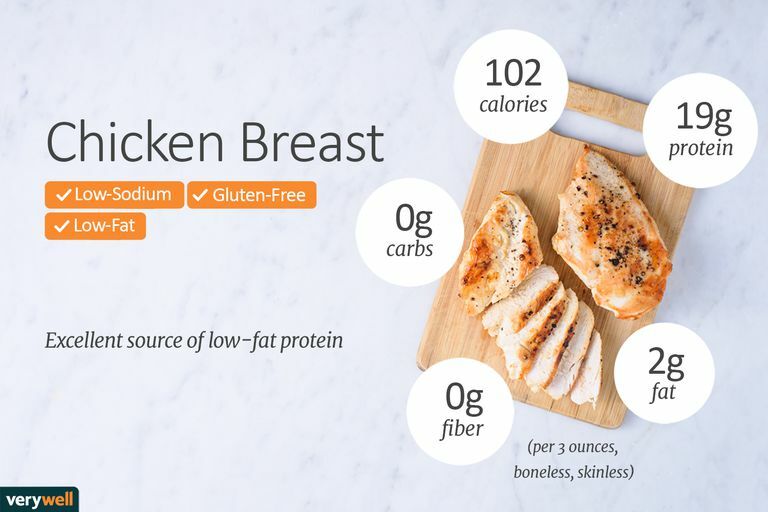 A whole chicken breast with skin provides 366 calories, 55 grams of protein, 0 grams of carbohydrate, 14 grams of fat, 4 grams of saturated fat and 132 milligrams of sodium. The preparation method and any sauces or flavorings that you add can make a big difference as well. Three ounces of rotisserie chicken provides 170 calories, 1 gram of carbohydrate, 11 grams of fat, and 15 grams of protein. One medium fried chicken breast provides 364 calories, 34 grams of protein, 13 grams of carbohydrate, 18 grams of fat, and 697 milligrams of sodium. Chicken breast is an excellent source of low-fat protein. Protein helps your body to maintain muscle mass and also helps you to build muscle if you are participating in a strength program. Chicken breast is also a very good source of selenium, phosphorus, vitamin B6, and niacin. Depending on the cooking method you choose, chicken breasts are also naturally low in sodium. You can purchase chicken breasts that are pre-trimmed and ready to use. In many grocery stores and bulk warehouses, you might also find chicken breasts that are frozen and individually wrapped. If you buy one of these convenient options, be sure to check the nutrition facts label. These varieties of chicken breast may provide more sodium. When you cook chicken, be sure that you cook the poultry to the proper internal temperature for food safety purposes. Boneless chicken should reach an internal temperature of 170 degrees Fahrenheit, bone-in chicken should reach 180 degrees Fahrenheit. Be sure to thoroughly clean any surfaces where you prepared raw chicken. Chicken should be kept in the refrigerator. Chicken can also be frozen for up to nine months. The way you prepare chicken breast can add hundreds of calories to the final fat and calorie count of your meat. Roasting, broiling, or boiling the breast is generally the healthiest preparation methods. Frying or sauteeing the meat in butter or oil will add fat and calories. In addition, adding condiments like barbecue sauce, olive oil, or dipping sauces will boost your calorie and fat intake. Need a quick and easy chicken breast meal? This quick and easy Chicken Breast With Potatoes and Veggies recipe can be prepared on a Sunday night to provide a week's worth of diet-friendly dinners. Pre-package the meals and keep them in the refrigerator so they are ready to go when you come home after a long day's work. But remember that you can use low-calorie chicken breast in different types of recipes, as well. For example, Low-Carb Stuffed Chicken Breasts are a delicious way to enjoy the lean protein if you follow a low carbohydrate diet. You can also throw a chicken breast on top of your favorite healthy salad, healthy soup, or add chicken breast to a pita pocket with veggies for a healthy lunch or dinner. Remember that even though chicken breast is a healthy, low-calorie food for dieters, overeating any food can cause weight gain. Use smart portion control tools and strategies with this food and at all of your meals and snacks to reach and maintain your healthy weight.